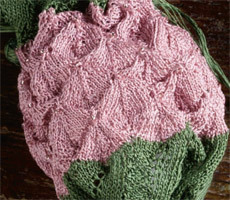 Knit this vintage-inspired pineapple coin purse with silk thread, as seen in PieceWork's 6th annual historical knitting issue. Exclusive to the Needlework Traditions Shop, the beautiful Vintage Pineapple Purse pattern is available in a Kit complete with the pattern, needles, and thread. Hurry, we have a very limited quantity of kits, so order yours today while supplies last! 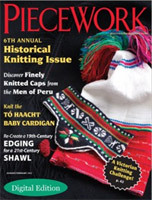 The digital edition of PieceWork January/February 2012: The 6th annual historical knitting issue, this magazine celebrates knitted caps from Peru, an Orenburg shawl, gloves, a knitted baby cardigan, and many purses. 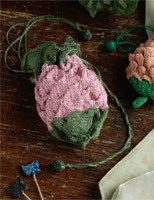 The Vintage Beaded Pineapple Purse pattern, featured in PieceWork January/February 2012 and adapted by Ave T. Coleman for modern-day materials. Penny purses and coin purses date back to the 1790s. Most were knitted, netted, or crocheted with colored silk, embellished with glass beads, and featuring drawstring or button closures. This vintage pineapple purse featured in PieceWork likely dates from the early 1800s. Adapted by Ave T. Coleman, this small purse's knit stitches resemble the leaves and texture of fruit. Kreinik Silk Bella thread in Light Wood Violet and Dark Sage. This kit contains two 100m cones, enough thread to knit the vintage-inspired Pineapple purse as seen in PieceWork January/February 2012. This 3-ply twisted-filament silk thread has sheen and strength, and shows off the intricate stitches and the texture of the pineapple purse. *Colors may vary slightly from what is seen here. HiyaHiya 6 inch size 5/0 (1.0 mm) double point steel knitting needles perfect for knitting this purse with fine thread. These slick needles are a great addition to any knitter's collection with various uses for intricate work. to be cherished for years and years to come. *This Kit does not contain the beads seen in the PieceWork January/February 2012 issue. Beads must be purchased separately and can be found at your local bead shop or craft store. Hurry! We have a limited supply of Vintage Pineapple Purse Kits.